Background: We have previously shown that laparoscopic (LAP) colectomy can be accomplished safely for the curative treatment of benign and malignant colorectal disease. Hand-assisted (HA) laparoscopic surgery appears to be an effective treatment for colorectal disease as well. Here, we perform a comparative analysis of clinical outcomes for open, LAP, and HA segmental colonic resection. Study Design: All open, LAP and HA sigmoid and right hemicolectomies performed in our institution from 1998 to the present were prospectively reviewed . A number of clinical outcomes, including operative time, lymph nodes harvested, perioperative morbidity and length of stay were compared. Results:The open sigmoidectomy group was older than LAP and HA (58.7 vs. 54.9 vs. 52.1, p=0.01). 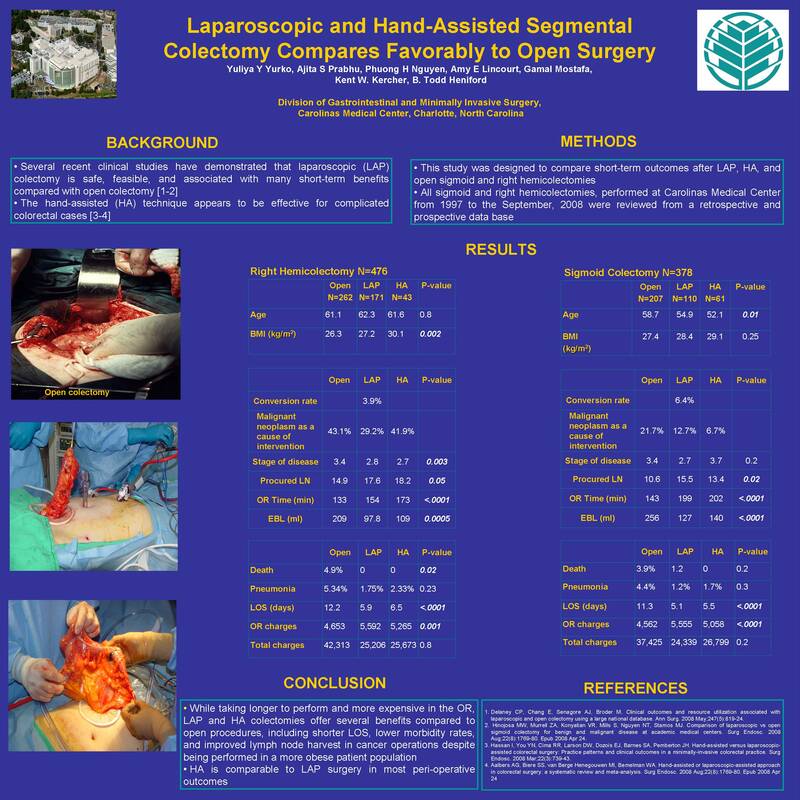 Conclusion:Results of this study show thatLAP colectomyoffers significant benefits when compared to open surgery, including shorter postoperative recovery, less blood loss and blood transfusions, more lymph nodes procured, lower morbidity rates application and a shroter LOS. HA can considered a valuable addition to LAP surgery, and it conveys many of the same benefits as LAP colectomy.